Turn your iOS device into a musical instrument with these best music-making apps for iPhone and iPad and unleash your inner talent. Are you an aspiring musician and you want to make music with your iPhone or iPad? You’re in luck! The App Store has hundreds of applications dedicated to music. If you are a musician, whether professional or amateur, these apps are made just for you. We present to you the best music-making apps for iPhone and iPad to unleash your talent and bring out the musician in you. Are you ready? Let’s start. Best apps to make money with your iPhone and iPad. Best iPhone and iPad applications for making music on your touch screen device. It is impossible not to begin this article with one of the best music apps in the world. GarageBand is the official app for Apple that turns your iPad or iPhone into a complete recording studio with touch instruments to create music anytime, anywhere. With GarageBand, you can establish a song from scratch. Choose different batteries, schedule them, add a bass, a guitar, keyboard or even a voice. Use Multi-Touch gestures to play the piano, organ, guitar or drums. The possibilities are endless which make it the best for aspiring musicians. Best free applications to download music on iPhone and ipad. MorphWiz is another great application for music makers. This application turns your device into a synthesizer that can play different sounds, effects and everything you would expect including performing vibrato with your fingers. The best music streaming apps for iPhone and iPad. Music Maker Jam is a free app for creating music on iOS devices. With this app, you can make music from scratch by combining various musical instrument sounds and mixing them together. With a multi-track, you can overlay and combine several loops and agreements in order to create a completely new and original music. Unlock your musical imagination and create your own amazing tracks. AmpKit is the best friend of a guitarist. This application provides a huge list of amplifiers and effects pedals that can be used for composing, playing and recording music with that particular sound you want. You just need the app, buy the pack of effects and amp you want, the cable to connect the iPad to your guitar, and you’re ready to rock. This application is free to download. If you’re a Dj and want to mix music with the screen of your iDevice, this application should be on your iPad or iPhone. Use your mobile phone to mix music anywhere enjoying the professional features of Traktor. With its three-band equalizer you can configure different filters for each channel, all using gestures with the tip of your fingers. The application itself will offer you similar tempo songs in the same key, so it will be impossible to clash between songs. Best music player applications for iOS. Pacemaker is another free music making apps for iPad and iPhone, with which you can do different mixes. It lets you mix your music from iTunes and Spotify. If you are a striking DJ or at least experience mixing songs, you can give Pacemaker a try. 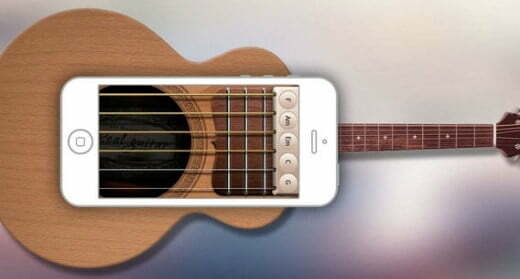 With PocketGuitar, you can turn your iPhone into a guitar with all the typical effects. Its not a professional app but an excellent idea for the fans of this musical instrument. Download the best music apps for iPhone and iPad mentioned in the list above and share your experience and thoughts in discussions form below. Also, if you are using any other iOS apps for the purpose of producing music on your device then do share the titles with us. Thank you for reading.